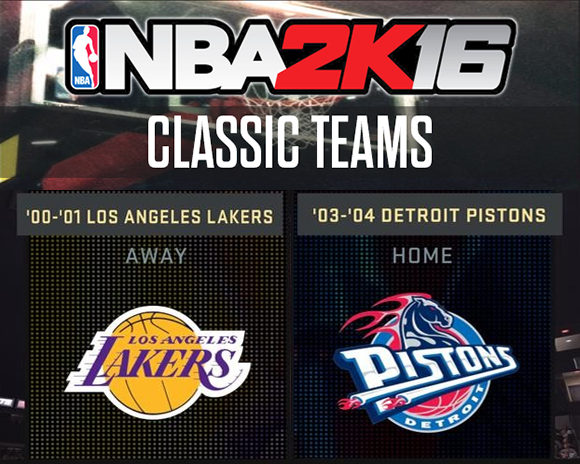 2K Sports has revealed two new classic teams for NBA 2K16 earlier today. The '00-'01 Los Angeles Lakers and '03-'04 Detroit Pistons will be added to the list of throwback teams joining the '99–'00 Portland Trail Blazers, '99–'00 Toronto Raptors, '02–'03 Dallas Mavericks, '07–'08 Boston Celtics, and '07–'08 Houston Rockets. Five more teams have yet to be announced. The 2001 Lakers team led by Kobe Bryant and Shaquille O'Neal is one of the most-dominant teams in NBA history. They finished with 56 regular-season wins and went 15-1 in the postseason en route to winning the championship. Known best for their defense and physical style of play, the '03-'04 Pistons put an end to that Lakers dynasty, winning 4-1 in the finals. Both teams are great addition to the 30+ classic teams that have been previously added. Which classic NBA teams would you like to play this year in NBA 2K16? Let us know in the comments!